Click here for all the webinar recordings and related resources in the on-farm variety trial toolkit! This webinar will introduce farmers to the practice of variety trialing, detailing the reasons one might choose to conduct trials and how to plan a trial with a scope, scale, and focus appropriate to the growers’ needs. This session will also cover seed sourcing, and important considerations for trial planting and management. Find the recording at the On Farm Variety Trials Toolkit page here. This webinar will focus on record-keeping and trial evaluation, as well as analysis and interpretation of final results. This session will introduce participants to some intuitive techniques for keeping data organized, and user-friendly online tools to aidin analyzing information collected and drawing conclusions from trial results.Find the recording at the On Farm Variety Trials Toolkit page here. Kitt Healy is the Organic Seed Alliance Research and Education Associate for the Midwest region. Her masters research focused on conducting tomato variety trials for short-season organic production, and engaging chefs and local farmers in participatory breeding and evaluation projects. Dr. Julie Dawson,Assistant Professor, University of Wisconsin- Madison. She is Assistant Professor for Urban and Regional Food Systems in the Department of Horticulture at UW-Madison. Her research focuses on variety trialling and breeding for organic systems in the upper Midwest. Jared Zystro, Research and Education Assistance Director, Organic Seed Alliance. Jared manages regional organic seed system development in California, conducts participatory breeding projects and variety trials, and teaches farmers about seed production and plant breeding at workshops, conference, and field days, and collaborates on other projects throughout the country. 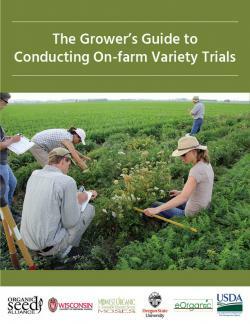 Download this guide to conducting on-farm variety trials for organic producers at https://seedalliance.org/publications/growers-guide-conducting-farm-vari.... This guide provides farmers fundamental skills to conduct on-farm variety trials that reflect their particular goals and farming operations. Readers will find scientific principles presented in an accessible way, and will be walked though the process of planning, implementing, evaluating, and interpreting a variety trial. This tool is useful for farmers, as well as for research, extension, and non-profit programs looking to train farmers as co-researchers when conducting on-farm trials. This material is funded in partnership by USDA, Risk Management Agency, under award number RM17RMEPP522C027/4500075447.